Wheat Celosia has graceful waves of rose-pink flowers shading to silver at the base. 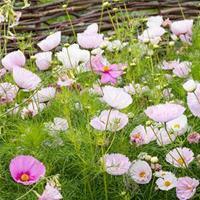 Well-branched plants for maximum blooms; great fresh or dried cut flower. Midsummer to fall bloom. Depth: Surface to barely cover. Starting Indoors: Sow indoors 6 weeks before last frost. Cover with vermiculite and keep at 68-78°F until germination then at 65°F. Starting Outdoors: Sow outdoors about two weeks after last frost for later blooms. Two weeks after last frost, when soil has warmed. An unusual addition to cottage gardens of mixed summer annuals and an ideal cut flower-both fresh and dry, this spike Celosia has soft pastel colors and an interesting texture. Be sure to keep soil evenly moist and fertilized, as any check in their growth will result in stunted plants with small premature flowering. Watering Details: Keep evenly moist—do not allow to dry out, but do not allow soil to become soggy. Fertilizer: Scratch in a couple of inches of compost before planting. Alternatively, feed once a month during the growing season with an organic, all-purpose water soluble fertilizer. Scratching in a granular fertilizer is another good alternative. Diseases & Pests: Susceptible to aphids, spider mites, and whiteflies that can be controled with insecticidal soap. Provide air circulation and keep water off the leaves or water early morning to discourage any leaf spots. An organic fungicide, such as copper can also be used. Plant: Well-branched green stems with grass-like foliage. Flowering: Fluffy silvery-pink flowers have a bottlebrush look. If harvesting to use as dried flowers, do so as soon as they start to appear vibrant in color, so as to retain as much color as possible. Seeds: Flowers will turn into seed heads containing tiny black seeds, about the size of a pinhead. The genus name Celosia is derived from the Greek word for burning, keleos. It is in reference to the intensely-colored flowers.